Like most of its lunar predecessors, SMART-1 will conclude its scientific observations of the Moon through a small impact on the lunar surface. This is planned to take place in the lunar Lake of Excellence, located at mid-southern latitudes on the Moon’s near side. The impact will most likely occur on 3 September 2006 at 07:41 CEST (05:41 UT), or at 02:36 CEST (00:36 UT) on the previous orbit due to uncertainties in the detailed knowledge of the lunar topography. The exact time of impact may change by a few minutes. If impacting on 3 Sept at 07:41 CEST, SMART-1 will touch the Moon at the lunar coordinates 36.44º South and 46.25º West. If impacting on 3 September at 02:36 CEST the lunar coordinates will be 36.4º South and 43.5º West. 1. What special manoeuvres did/do you have to perform up to impact? A two-week series of manoeuvres that started on 19 June and concluded on 2 July allowed SMART-1 to adjust its orbit to avoid intersecting with the Moon at a disadvantageous time from the scientific point of view, and to obtain a useful three-week mission ‘extension’. A further series of minor manoeuvres were performed on 27 and 28 July. Additional opportunities for minor trajectory adjustments will be available on 1 and 2 September 2006. 2. SMART-1 will hit the Moon on Sunday 3 September. Why that date in particular? The choice of 3 September for lunar impact was led by the decision to obtain further high-resolution lunar data from orbit and to allow ground telescopes to see the impact from Earth. For this purpose, the spacecraft control team at the European Space Operations Centre (ESOC) in Darmstadt, Germany performed a two-week series of manoeuvres started on 19 June and concluded on 2 July. These allowed SMART-1 to adjust its orbit to avoid having the spacecraft intersect with the Moon in mid-August on the lunar far side – a disadvantageous time and location from the scientific point of view. As mentioned, this also gave a useful three-week mission ‘extension’. On 3 September 2006 the SMART-1 perilune, coinciding with the point of impact, will be on the lunar near side (facing Earth), in an area called the ‘Lake of Excellence’, located at mid-southern latitudes. This area is very interesting from the scientific point of view - a volcanic plain area surrounded by highlands, but also characterised by ground mineral heterogeneities. At the time of impact this area will be in the dark, just near the terminator – the line separating the lunar day-side from the night-side. The region will be shadowed from the Sun’s direct rays, but it will be lit faintly by the light from the Earth – by earthshine. The spacecraft’s orbit will take it over the region every five hours, getting one kilometre lower at each pass. From Earth, a Moon quarter will be visible at that time. 3. So, will the impact be visible from Earth? The impact geometry on 3 September is ideal to allow ground observations. In fact, during full Moon the luminosity would have completely obscured the impact to ground observers, and during new Moon it would have been difficult as well, because new Moon is visible for only a few seconds after sunset. Furthermore, an impact in the dark will favour the detection of the impact flash. Numerical simulations or laboratory experiments were run to help understand the impact and predict related observable phenomena - predictions are difficult because of the special conditions of the SMART-1 impact (low impact velocity - 2 kilometres per second - and very grazing incidence). Amateur and professional astronomers were also called to observe the site before and during the impact. So far, the following institutes have responded to the call: the network of Very Long Baseline Interferometry (VLBI) and radio observatories, the South African Large Telescope (SALT), the Calar Alto observatory in Andalucia, Spain, the ESA Optical Ground Station (OGS) at Tenerife, Spain, the CEA Cariri observatory in Brazil, the Argentina National Telescope, the Florida Tech Robotic telescopes, US telescopes, NASA IRTF, Canada—France CFHT and Japanese Subaru Auxiliary telescopes on Hawaii, as well as a number of professional and amateur astronomy telescopes around the world, and the ODIN observatory from space. The ground telescopes will also try to observe the dust ejected by the impact, hoping to follow the dynamics of the ejected material and to obtain physical and mineralogical data on the material excavated by the spacecraft. There is a possibility that at this grazing incidence the probe can bounce once. Then the spacecraft itself could emit as a small fireball before falling back. The expected impact time (07:41 CEST) will be good for big telescopes in South and Northwest Americas and Hawaii and possibly Australia. But if SMART-1 hits a hill on its previous pass, around 02:37 CEST on 3 September, then it could be observed from the Canary Islands and South America. If SMART-1 hits a hill on the pass on 2 September at 21:33 CEST, then telescopes in Continental Europe and Africa would have the advantage. 4. How can you be sure you will hit the Moon on 3 September? The time of impact has been determined by orbit predictions following the thruster manoeuvres performed from 19 June to 2 July 2006 (plus a few trajectory correction manoeuvres performed on 27 and 28 July), taking into account the Sun-Earth- Moon perturbations that make the SMART-1 orbit perilune (point of closest approach to the lunar surface) naturally drift down about one kilometre per orbit. In the impact orbit determination, ESA’s spacecraft control experts are also taking into account the tiny perturbations to the trajectory induced by the small hydrazine thrusters to offload the spacecraft reaction wheels, and some slight additional gravity perturbations. Furthermore, a slot is available for a corrective manoeuvre on 1 and 2 September 2006 if necessary, to maintain the impact time as planned to allow ground-based observations. An uncertainty on the time of impact is however given by the still-not-completely-known lunar topography. The best lunar topography maps available are based on the data from the laser altimeter experiment (LIDAR) on board the US Clementine mission (1994), which provided the spacecraft altitude on a grid about every kilometre. The values in between have been interpolated assuming that no accidental peaks are in those areas. However, there is still a chance that an unknown peak is just in SMART-1’s way as the spacecraft spirals down until impact. This means that, if encountering a relief of about one kilometre high, SMART-1 may hit ground at 02:37 CEST (00:37 UT), when the spacecraft will be flying at about 800 metres altitude. This is one orbit earlier than the estimated 07:41 CEST (05:41 UT) impact on 3 September. In other words, for SMART-1 the last lunar approaches it will be like low-altitude flying with incomplete terrain maps. Hopefully SMART-1 and the next fleet of orbiters will contribute to improve maps for future lunar exploration. 5. Isn’t it wasteful, to ‘crash’ an expensive piece of equipment, on purpose? To break away from the Moon’s gravity and go off into deep space would have meant cancelling the science programme entirely. In fact, by the time SMART-1 had settled in its orbit around the Moon, there was enough propellant left for an orbital boost, but not for an escape. The spacecraft was a ‘true’ prisoner of the Moon. When a spacecraft orbits around the Moon, as SMART-1 does, it is doomed by the law of gravity. Tugs from the Sun, the Earth, and irregularities in the Moon itself, all disturb its orbit. Sooner or later, any lunar orbiter will impact the Moon surface unless it has very large amounts of fuel left to be re-boosted and escape the lunar gravity. SMART-1 has already survived far longer than the SMART-1 team expected when the mission was initially planned. Its experimental ion engine, powered by the Sun, was very efficient. By the time SMART-1 had settled into its orbit around the Moon in March 2005, there was only 7 kilogrammes of propellant left – bottled xenon gas - of the 84 kilogrammes at launch. We used all the remaining xenon in Summer 2005 to re-boost the orbit and avoid an early impact originally due on September 2005. As a result, SMART-1 gained an extra year of operational life in its lunar orbit. Once SMART-1 had consumed all of its xenon propellant, we could not boost the orbit again, in any big way. Left to itself, SMART-1 would have made its impact landing on 17 August 2006 on the far side of the Moon. Not very exciting for astronomers or people that wanted to watch the impact! So mission control decided to gain three more weeks of operations in a very clever way by using the hydrazine thrusters - small rockets usually operated just to re-orient the spacecraft – in combination with the reaction wheels. This lifted the orbit enough to move the impact site to the near side of the Moon, where observers on the Earth can see the event. This is now expected on 3 September with a current expected time at 5:41 UT (07:41 Central European Summer Time). But we call for observations over the previous passes (5 and 10 hours before), that are so close to the surface that a hill might just be in the way and cause an earlier impact. To break away from the Moon’s gravity and go off into deep space would have meant cancelling the science programme entirely. In fact, by the time SMART-1 had settled in its orbit around the Moon, there was enough propellant left for an orbital boost but not for an escape from the Moon gravity field. The spacecraft was a ‘true’ prisoner of the Moon. 7. Some people may think that having SMART-1 hit the Moon on purpose is rash, perhaps dangerous. Is ESA considering any possible threat to the Earth? There is no danger to our planet. SMART-1 is not big enough or fast enough to knock any rocks off the Moon which might be capable of reaching the Earth - at impact, the spacecraft vertical speed will be only 70 kilometres per hour, which is less than some ski jumpers achieve. Just as SMART-1 already belongs to the Moon, and obeys lunar gravity, the same will be true for any material thrown up on impact. It cannot escape from the Moon. 8. But won’t the impact of SMART-1 harm the Moon? Nearly 50 years ago the Russian Luna-2 spacecraft was the first man-made object to hit the Moon. That was in 1959. Since then many other objects have done the same, and SMART-1’s impact will be softer than that of any man-made impactor so far. 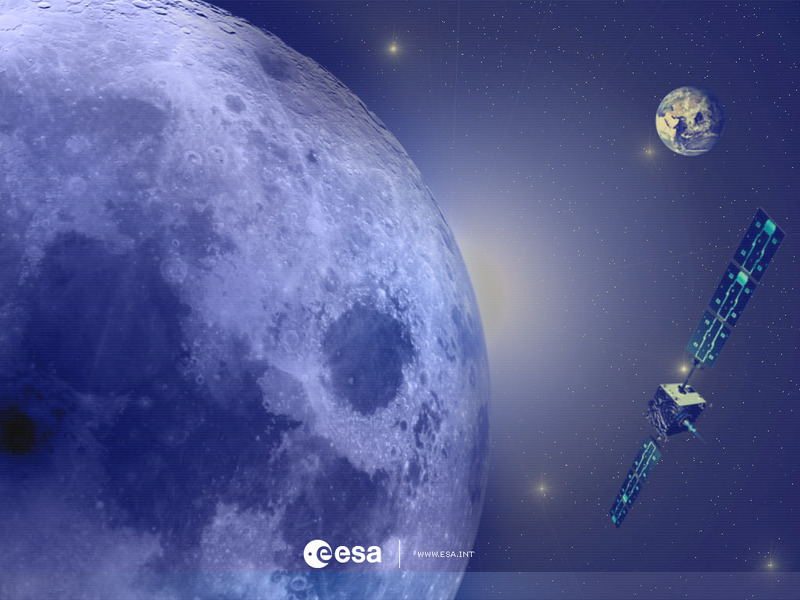 When it arrives at the Moon’s surface, SMART-1 will be travelling at 2 kilometres per second. That is much slower than a natural meteoroid - for instance Leonid meteoroids arrive on the Moon at 70 kilometres per second, and note that their kinetic energy increases as the square of velocity! And the spacecraft will go in at a glancing angle – like a ski jumper. If we were unlucky SMART-1 might hit a steep hill at 7000 kilometres per hour, but what is more likely is that it will glide down over a flat part of the lunar surface, dropping 15 metres in the last kilometre of forward motion. At impact, its vertical speed will be only 70 kilometres per hour, which is less than some ski jumpers achieve. Possibly SMART-1 will skid for a short distance after impact, throwing up dust ahead of it and spraying dust out on either side like the wings of a butterfly. The crater made by SMART-1 will be 3 to 10 metres wide and perhaps a metre deep. To put that in perspective, the Moon already has 100 000 craters that are more than 4 kilometres wide and every day several small meteoroids make craters as big as SMART-1’s. So you would not notice much difference. International rules protect other planets and their moons from possible contamination by spacecraft. The safety of any alien life, if it exists, is the main concern. ESA takes its legal responsibilities very seriously, and follows all current planetary protection rules, as established by the Committee on Space Research (COSPAR). 9. What about chemical contamination with materials from the Earth that do not belong on the Moon? Every chemical element present on SMART-1 and in its instruments exists naturally on the Moon. For instance aluminium and iron are very common. Hydrogen, carbon and nitrogen are much scarcer, but they arrive naturally onto the lunar surface from the solar wind and from the impacts of icy fragments of comets, which contain many elements. From this point of view, one can think of SMART-1 as an artificial comet. Furthermore, the little hydrazine left in the SMART-1 thrusters will burn immediately at impact. 10. There will still be the wreckage of SMART-1, so is the beautiful Moon to become a junkyard of old spacecraft? We should not think of it as junk. With its relatively low impact speed, SMART-1 should be much less fragmented than the dozens of other spacecraft that have hit the Moon. Damaged certainly, and with its solar panels torn off, the main part of SMART-1 may remain on the lunar surface as a monument to Europe’s exploration of space. 11. Will scientists learn anything from the impact on the Moon? The last SMART-1 observations before impact will provide new impressions of the lunar landscapes. As the impact will occur in a dark area of the Moon, we cannot expect to see very much by visible light during the final descent, but we are looking forward to late images from SMART-1’s final moments. Mission control will be receiving signals right up to the impact, with the spacecraft antenna pointing towards the Earth. During close lunar approaches, the camera will have oblique views of some areas that we have previously looked at only vertically, providing a sort of three-dimensional view of the surface. During the last orbits, the other instruments, including the D-CIXS X-ray telescope and the SIR infrared spectrometer, will have detailed views of some regions from very low altitudes. Powerful telescopes on the Earth may see a faint flash from the impact itself, followed by a cloud of dust thrown up by the impact, perhaps 5 kilometres wide. The dust will obscure the view of part of the Moon’s surface for 5 or 10 minutes. On a nominal impact on 3 September at 07:41 CEST, the impact angle will be one degree, that could generate some elongated ejecta structures, with ‘butterfly wings’ on the side. The behaviour of the cloud will give valuable information about impact events in general, while the analysis of the light from the dust, with spectrographs in the telescopes, may detect materials dug up by the impact from just beneath the lunar surface. Astronomers have done this sort of thing before, when NASA’s Deep Impact spacecraft hit Comet Tempel-1 in July 2005; that was a far more energetic event. 12. Whatever happens, the impact will be the end of your mission. What have you found out with SMART-1? SMART stands for Small Mission for Advanced Research and Technology. The major technological demonstration was the first use of solar electric propulsion for interplanetary travels, in combination with gravity assist manoeuvres. Such a propulsion system will be used for ESA’s BepiColombo mission going to the planet Mercury. SMART-1 also tested future deep-space communication techniques for spacecraft, techniques to achieve autonomous spacecraft navigation, and miniaturised scientific instruments to examine the surface of other worlds in visible, infrared and X-ray light, used for the first time around the Moon. BepiColombo and other science or exploration spacecraft will carry similar instruments. As for our investigation of the Moon itself, SMART-1 has mainly studied the past impacts that have created all those craters on the Moon. Having 16 months in close orbit instead of the 4 months initially planned, SMART-1’s camera has built up a large library of images of craters large and small all over the Moon, not least around the poles where previous observations were patchy. The infrared instrument has measured changes in the spectra of the lunar soil, between different parts of impact craters, to reveal the composition of subsurface material bounces upwards in the centre, during the impact. Lunar scientists suspect that the biggest impact of all was at the birth of the Moon from a huge collision between the newly formed Earth and a small planet, 4.5 thousand million years ago. The X-ray instrument on SMART-1 has gathered the best information available so far about the various elements present on the lunar surface. When the results are fully analysed they may support or challenge that theory of the Moon’s origin. Although the observation phase of the mission will soon be over, scientists will be working on the results for years to come. 13. Is that the end of the story for European missions to the Moon? Definitely not. In a year or two, India’s Chandrayaan-1 spacecraft will go into orbit around the Moon, equipped with the same European infrared and X-ray instruments as carried on SMART-1. The SMART-1 team and European experts are already collaborating with the teams preparing the next lunar missions in China, Japan, India and the United States. SMART-1 data can also help to select the sites for future landers, robotic villages and to prepare for the return of humans to the Moon .